Hofstra University's Department of English offers undergraduate concentrations in Literatures in English, Creative Writing, Publishing Studies, and Children's and Young Adult Literature, and the university's close proximity to New York City enriches the curriculum and provides incomparable opportunities for internships and experiential learning programs. The Great Writers, Great Readings series brings award-winning writers across the genres to campus to engage students in intimate writing workshops and readings. Students can get published in a student literary magazine, Font; join a chapter of the English honor society Sigma Tau Delta; or participate in the College's oldest study abroad program, in London, studying contemporary British playwrights from Samuel Beckett to Tom Stoppard. You will be taught and mentored by a diverse and accomplished faculty consisting of nationally recognized literary scholars, editors, novelists, poets, playwrights, and popular writers. Students are sure to find their niche in a nurturing department where faculty research and writing interests range from Milton to Herman Melville to Toni Morrison, from opera and pop culture to gay and lesbian studies and disability studies. The English Department faculty is committed to serving students and developing their literary knowledge, editing skills, and writing talents in lectures, seminars, and workshops. Professors of literature and creative writing hold the highest degrees in their fields. Those who teach publishing have at least 20 years of experience in the industry. Our alumni have found success in a wide range of careers, including publishing, academia, law, advertising, television, and film. 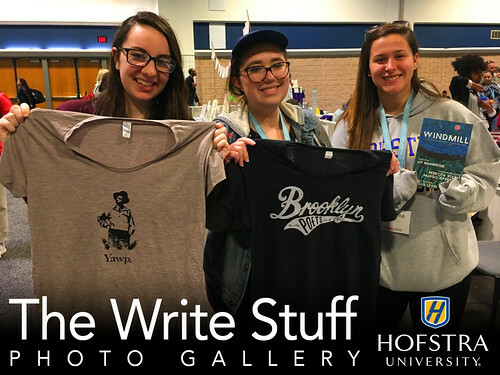 Students have also continued their studies in Hofstra's MFA in creative writing program. Hours before dawn, the day after a blizzard rushed through New York, six publishing studies students piled into an airport van to head for Tampa for the annual Association of Writing Programs and Professionals conference, the largest single gathering of writers in the U.S.